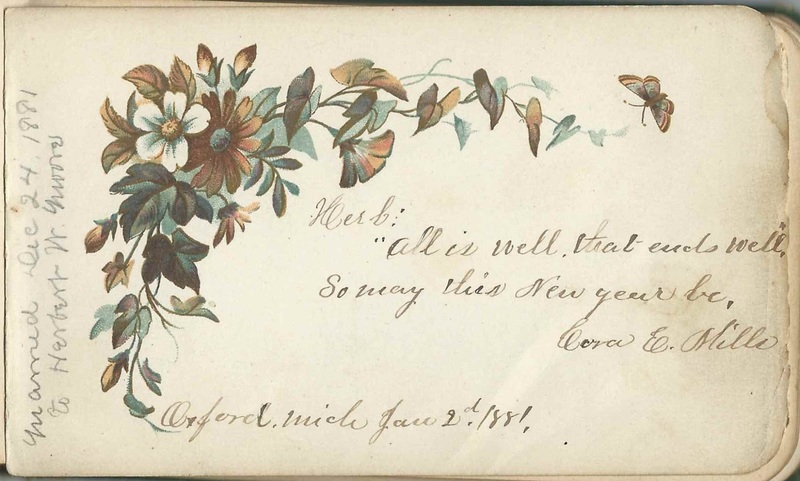 Autograph album presented to Herb by Cora on December 25, 1880. "Herb" may have been Walter Herbert Moore and Cora his future wife Cora E. Mills, whom he married on December 24, 1881 in Oakland County, Michigan. Cora E. Mills inscribed a page at Oxford, Michigan, on January 2, 1881. The album measures approximately 5-1/2" by 3-1/2" and contains the sentiments of over 60 of Herb's relatives, friends and schoolmates. An alphabetical surname list and an alphabetical list of the inscribers, together with any personal information they offered, appear at the end of this post. Aunt Mary, who inscribed her page to C. & H.
On December 24, 1881 at Pontiac, Michigan, Walter Herbert Moore married Cora E. Mills, daughter, according to her Michigan Death Record, of Platt Rogers Mills and Hannah L. (Babcock) Mills. Walter Herbert Moore and Cora raised their family of at least two children in Oakland County, Michigan. Cora died in 1922 and Herb in 1931. They're buried in the Oak Hill Cemetery at Pontiac, Michigan. If you have corrections and/or additions to the information above, or an alternate theory of the identity of the Herb who owned this autograph album, please leave a comment or contact me directly. Herb, presumably of Pontiac, Michigan, area; presented the album by Cora on December 25, 1880. He may have been Walter Herbert Moore, and Cora may have been his future wife Cora E. Mills. Cora; presented the album to Herb on December 25, 1880. Possibly the Cora E. Mills who inscribed a page at Oxford, Michigan, on January 2, 1881, and who became the wife of Walter Herbert Moore in 1881. Friend Kitty; inscribed on Sunday, June 25th, no year written. "B.L.E., K. A. L.". Herb's later note: "Married M. Molampy"
Susie; inscribed at Pontiac, Michigan, on April 10, 1881. Herb's later note: "Married to M. J. Sharp 1883" or "Married to Mr. J. Sharp 1883" Possibly the Jacob M. Sharp, the next inscriber in the album, whom Herb noted married Susie Strickland in 1883. Emma D. Baker; inscribed at Oxford, Michigan on January 8, 188 [though very faint]. Her surname is also too faint to read but Herb's later note: "Married Dec 7, 1881. to Clark Dibble, Oxford; Died January 2, 1887" made her identity possible: Emma D. Baker. A. D. Baldwin; inscribed at Oxford, Michigan, on December 30, 1880. Herb's later note: "Married Aug 14, 1884 to Miss Libbie Beebe". Libbie Beebe, who also inscribed a page in the album, married Arthur D. Baldwin. "Mother Beebe" of Oxford, Michigan; inscribed on January 8, 1881. Libbie Beebe; inscribed at Oxford, Michigan on January 7, 1881. "Call on me in 1891"; perhaps this inscription was written in 1881. Herb's later note: "Married Aug. 14. 1884 to A. D. Baldwin" - Arthur D. Baldwin, who also inscribed a page in the album. L. A. Brokenshaw; inscribed at Pontiac, Michigan, on June 13, 1881. Herb's later note: "Married to Chas. Hunt". I found a record for a Laura A. Brokenshaw who married Charles Hunt. Helen Chatterson of Wainfleet, Ontario; inscribed at Pontiac, Michigan, on June 12, 1881. Herb's later note: "Married Feb 28, 1883 to Thomas McGill...Died Jan 27 1885"
John Conroy; inscribed at Detroit, Michigan, on September 3, 1881. Herb's later note: "Married to Mary Mathews"
A. L. Curtis; inscribed at Rochester, presumably Michigan, on February 2, 1882. Herb's later note: "Married about the 1st Nov 1882 to Laura Hayes"
Emma M. Fuller of Naples, New York; inscribed on April 14, 1881. Herb's later note: "Married March 6, 1884 to Mr. Lee Maring"
Jonathan A. Mark; inscribed at Oxford, Michigan, on October 15, 1881; "baggageman D & BCRR"
Laura F. Mattison of Pontiac, Michigan, inscribed on February 2, 1884; age 9 years. "Herb who learnt me to walk"
Charles S. May of Oxford, Michigan; inscribed there in January 1881. Herb's later note: "Married March 7 1882 to Martha Wilcox". Cora E. Mills; inscribed at Oxford, Michigan, on January 2, 1881. Herb's later note: "Married Dec 24, 1881 to Herbert W. Moore". Walter Herbert Moore, album owner, may have been Cora's future husband. Nellie Moore; inscribed on January 11, 1881. Herb's later note: "Married to David Little of Detroit Oct 30 1881"
Bessie Newton; inscribed at Pontiac, Michigan, on May 29, 1881. Herb's later note: "Married Dec 4 1884 to Walter H. Judd"
? Nichols, possibly J. F. Nichols; inscribed at Pontiac, Michigan, on April 6, 1881. Herb's later note: "Married August 10, 1882"
A. L. Palsgrove of Waterford, Pennsylvania; inscribed at South Bend, Indiana, on February 26, 1881. Could instead be A. S. Palsgrove. "Your partner in the Barn...One of the Boys"
Allie L. Sharp; inscribed on June 13, 1881. Herb's later note: "Married Nov 17, 1882 to William Draper"
Jacob M. Sharp; inscribed at Pontiac, Michigan, on April 10, 1881. Herb's later note: "Married to Susie Strickland 1883". Susie Strickland may have been the previous inscriber in the album, whom Herb noted married an M. J. Sharp or Mr. J. Sharp. Eli Simpkins, E. M. A., Pontiac, Michigan, inscribed on February 23, 1885. Lulu A. Wills of Ypsilanti, Michigan; inscribed on August 11, 1881. "Remember me as one of the old maid book agents that troubled you so".